Come see this cozy ranch home with great access to Hwy 285 and Downtown Conifer. Located on 2 lots (almost 1 acre), this wooded property is private,yet close to shopping and the elementary school. Sit outside,enjoying nature and the mature pines and firs,on the huge wraparound deck or on the covered part of the deck off of the kitchen. Refinished hardwood floors, New Kitchen Floor, New windows on 6/21, New Sliding Patio Door, New light fixtures, Newer refrigerator, electric stove and dishwasher. All new interior paint throughout. Remodeled bathroom with New vanity, Gorgeous Shower tiles, all new fixtures and floor. Fireplace has built in shelves in the large comfortable living room. 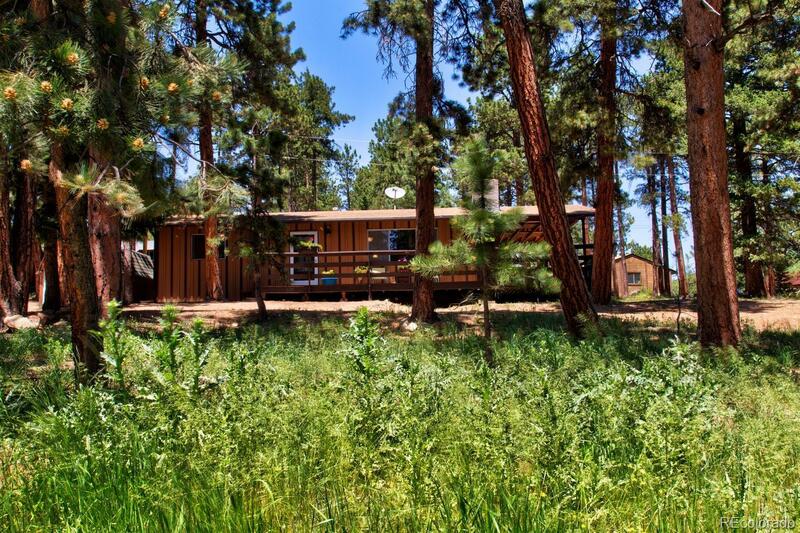 Multiple hiking areas, zip line tours, Evergreen Lake activities are close as well as the library. Outdoor shed for storage. Quiet neighborhood with natural flowers and flat wooded land. GAS FORCED AIR Heat! 1 year home buyers warranty provided! Excellent Cell reception!! Come home to the mountains!